In January of 2008 Owen Ogletree and Don Beistle flew into Bavaria and Franconia for a quick visit in search of the best beers in the regions. 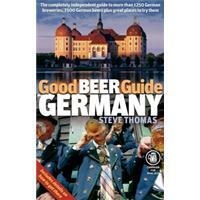 Don Beistle writes the Ask Dr. Brewski Q&A column for Southern Brew News, knows most everything about Bavaria and Germany, speaks quite a bit of German, but had never been to Europe until this trip. It was a fantastic visit filled with scrumptious German beers. Old Town Bamberg is very walkable and is a beautiful bit of medieval Germany that was spared during the wars of the last century. 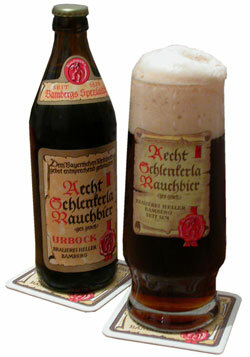 The beer specialty of the town is the famed Rauchbier that includes malt dried over a smoky beechwood fire. The smoke soaks into the malt and gives the Rauchbier its predominate flavor - one that you will either love or hate after the first sip. Don and I both think the Rauchbiers are wonderful works of brewing art. Print this page out, get a tourist map, and make your way to the lovely old town of Bamberg as soon as possible for a beer experience you won't soon forget. If you have experiences with any of these locations that you'd like to share, Owen always welcomes your e-mail and input. The Rauchbier is served at the bar from impressive wooden barrels that are lined with pitch to protect the beer. Schlenkerla smokes 100% of their own malt at the brewery, and the malt comes from local Franconian suppliers. Only bittering hops are used in the Rauchbier (no aroma hops), and the beer has a brown color and a smooth, toasty malt backbone. Schlenkerla also produces a rich, high gravity version (called Urbock) and some smoked wheat beers. Their Helles contains no smoked malt, but its slight smoky flavor actually comes from running the beer through the brewery's tanks and pipes. Try the extremely traditional (and meaty) Franconian food dishes at the tavern as well. The tavern opens at 9:30 AM (closed Tuesdays), and many regulars bring in their own breakfast to have with a glass of the Rauchbier - now that's dedication. The central hallway of the tavern has a booth that sells pretzels, takeouts and souvenirs. Just next door to the Schlenkerla tavern is this modern-style brewpub that produces 3-4 house beers. Usually a Helles, Weizen, Dunkel and Doppelbock are available. On our visit all the beers were a bit too sweet and fruity for style, but the attractive pub is still worth a visit. The food looked very promising, but we did not indulge. This cozy pub is named for the attractive tiled stove that is used to heat many traditional taverns. The food here comes in big portions and is stubbornly traditional. A fine range of local lagers and weizen is available. This old tavern can be quite difficult to find. It's located off some tiny lanes a few blocks south of Schlenkerla. The brewery tap was built here in 1988, and the small main room is known as the Braunbier-Stubla (brown beer pub). Stop in to sample the house's Pils, Braunbier (Dunkel) and Schwarzla (black beer). The darker beers had a distracting buttery (diacetyl) note on our last visit. Located just a few blocks east of Schlenkerla, Sternla holds the record as Bamberg's oldest tavern, and many say the pub has been in continuous operation since the early 1300s. Maisel's beers are now featured here with Pils, Weizen and the unfiltered Kellerbier usually available. The food menu contains many hearty and affordable choices. This old tavern, brewery and guesthouse is just a short walk across the river northeast of Max-Platz. Fassla is very traditional and offers affordable, spartan accommodation and fine food and beer. The friendly staff serves up the house Pils, Helles, Dunkel and Weizen to a crowd of mostly locals. Fassla is just across the street from Spezial, Bamberg's other Rauchbier outlet. Alt-Ringlein, Dominikanerstrasse 9 - Hotel with wonderful restaurant and good range of local beers. Bamberger Weissbierhaus, Oberre Koningstrasse 38 - This was once the original Maisel Brewery location and is now a very inviting pub. Eulenspiegel, Obere Brucke 10 - Quiet pub with a fine beer range. Michaelsberg-Benediktinerbrau, Michaelsberg 10 - This was an Abbey in a former life and is now a tavern / guesthouse next to the Bamberg Brewery Museum. Has an attached beer garden. Spezial, Obere Koningstrasse 10 - A beautiful brewpub that produces its own Rauchbier (lighter in flavor than Schlenkerla's) and traditional food. Is can be found across the street from Fassla (see above). Stillbruch, Obere Sandstrasse 18 - One room pub that opens most days at 6 PM.